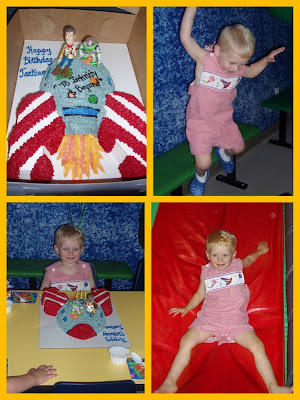 On May 2, 2004 we celebrated your first year of life with a circus themed birthday party. Lots of family and friends were there. You had the most precious circus cake and you loved every bit of it. You got tons of presents for your birthday and Giggles the clown came and made balloon characters for all the kids. It was a great day! On May 7th, 2005 we celebrated your second birthday with a construction themed birthday party and Bob the Builder and Wendy came to help us celebrate (to this day you will still look at pictures of Bob and Wendy at your party and tell us who they are... you don't even recognize them as granny and pap pap's friends Scott and Shirley... i love that :)). You had a Bob the Builder cake that was too cute and all your guest got Home Depot aprons with there names on it. It was a cute party! On May 6, 2006 we celebrate your third birthday at Fun Factory. It was a Buzz Lightyear birthday party. You had so much fun jumping in the "jumpy things", dressing up in the costumes, and playing the games. This was your first "jumpy" birthday party and really the first time you had actual "friends" that can to your party instead of just family and "mommy daddy friends". What a fun age! You were so excited about everything this year, presents, cake and all! 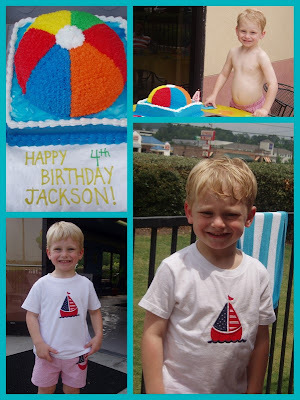 On May 5, 2007 we celebrated your 4th birthday with an indoor swimming birthday party. We had it at the Holiday Inn Express and you had the cutest beach ball cake. I think that was my favorite cake you have had. Since it was Cinoc de Mayo we had quesadias and mexican dips for your party food. You and your friends had a great time swimming! On May 3rd we celebrated your 5th! 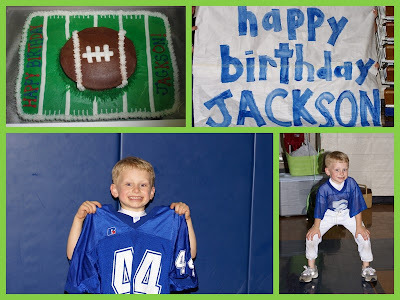 birthday with a Football Themed Birthday Party. We were suppose to have it at the high school stadium but it rained so we had it in the gym. Two of the high school football players came and did drills and games with all the "players". All your friends wore their jerseys or cheerleading outfits. It was a fun party even if we did have to do it inside. You had a chocolate football cake! Saturday we will celebrate your 6th birthday at Jumpin Jax. You and your friend Cole are having your birthday party together. I think this is the first year that I really feel like you are growing up! We have come to the point were we have "family birthday parties" and "friend birthday parties". You are having a birthday party with pretty much all boys except for a few girls (an mainly those are family... and you really did not want them to come... but mommy made you). You and Cole are having a baseball themed party and I am sure you are going to have a great time! Happy 6th Birthday to my little buddy. You are the best little boy a momma could ask for. You are 110% all boy and you don't sit still much. You are always on the go and playing hard. But you have the biggest heart and the sweetest spirit. I could not have ask for a more perfect "baby boy"! We are so blessed to have you!